Today we visit the Totally East: Life in East Germany Photography Exhibition. Run-down façades, punks and ordinary workers: This exhibition shows the works of Harald Hauswald, who documented everyday life in the GDR. So back to today’s episode. I walk through the exhibition with Dr Richard Millington who you will remember from our episode on the 1953 East German Uprising. 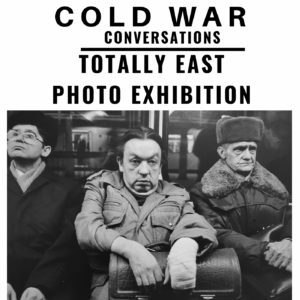 Richard has brought the exhibition to Chester and as we walk round we discuss the photos and have a wide ranging conversation about life in East Germany. After our chat there’s some interviews with exhibition visitors who reminisce about the GDR and comment on the exhibition. We also chat with a couple of Cold War Conversations Podcast listeners who came along too. Buy the exhibition guide book.